A few weeks ago I wrote about the missing blue plaques in the BBC's television Centre foyer, which used to honour William Hartnell, Patrick Troughton, and Jon Pertwee. 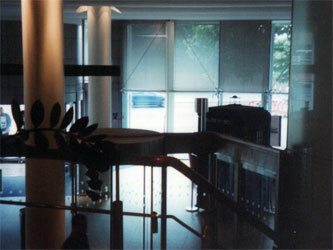 It was prompted by the fact that the BBC had a Dalek on display in the cafe where they used to be situated, as well as a TARDIS hanging around TVC's foyer. 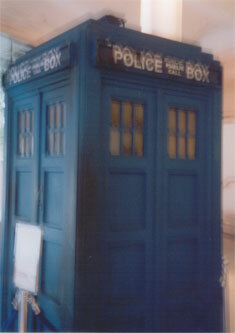 You are not meant to take photographs on BBC premises without a permit, which explains why, whilst trying to dodge security, I only got these two absolutely rubbish shots of the TARDIS at the time. However, it seems that the security guards in Television Centre have been using the TARDIS as an excuse for the odd practical joke. According to a story on the back of today's Pravda in-house BBC newspaper Ariel, someone spilling out of a late drinking session at the Television Centre bar found the TARDIS irrisistable, and wanted to touch it. As they did so, the Doctor Who theme tune blared out across the foyer PA, triggered by a security guard hiding behind reception! By Martin Belam on 25 September 2007.